Which Cushions are Best in the Sun? In a recent blog post, we discussed the pros and cons of various patio furniture materials in regards to withstanding our extreme Arizona weather. While the furniture base is extremely important, the cushions and pillows we place on top of them take an even greater beating from our Arizona weather. When cushions rip or fade, it can ruin the entire décor of your outdoor space, and cause otherwise beautiful patio furniture to look drab and dated. We’ve decided to follow up with the pros and cons of the most common cushion materials used for outdoor furniture in terms of how they stand up to our extreme sunshine. Durability: Unlike most fabrics on the market, solution-dyed acrylic is completely saturated with dye before it is turned into yarn and woven into fabric. Additional UV protective factors are also embedded during this process. Because of this, the color and the fabric itself is much more resistant to fading from the sun. Maintenance: Manufacturers of this fabric also put the acrylic through a stain resistant process, making rot and mildew a non-issue. This fabric is also extremely easy to spot clean with a wet cloth. Price Tag: These processes are effective, and also expensive. You’ll pay slightly more for cushions and pillows made from this fabric, however, they usually come with a warranty of about 10 years, so you’ll be rest assured your investment is worthwhile. Price Tag: Cotton canvas or duck cloth (cotton more tightly woven) are relatively inexpensive and available almost anywhere that outdoor patio furniture is sold. Because it’s inexpensive, it can easily be replaced often. The Look: Cotton canvas or duck cloth come in a variety of styles, colors and patterns. It will be easy to find the perfect look to accent your outdoor style. Durability: Unless cotton canvas or duck cloth are specifically treated, they are not normally stain or mildew resistant. You’ll need to add an additional protectant such as ScotchGuard or NeverWet to assist in the water-resistant qualities of this fabric. Cotton and duck fabrics are also dyed after the material is woven, making it more susceptible to fading in the sun. Durability: Although not quite as durable as solution-dyed acrylic, vinyl is also quite strong and flexible. Its PVC coated properties allow it to be flexible, durable, and resistant to fading from the sun. Maintenance: Vinyl fabric is extremely easy to clean. It can be sprayed off with a hose or spot cleaned with a wet cloth. It is also relatively stain resistant, and most messes can be wiped off quickly and easily without water. Comfort: Vinyl fabric is a form of plastic. 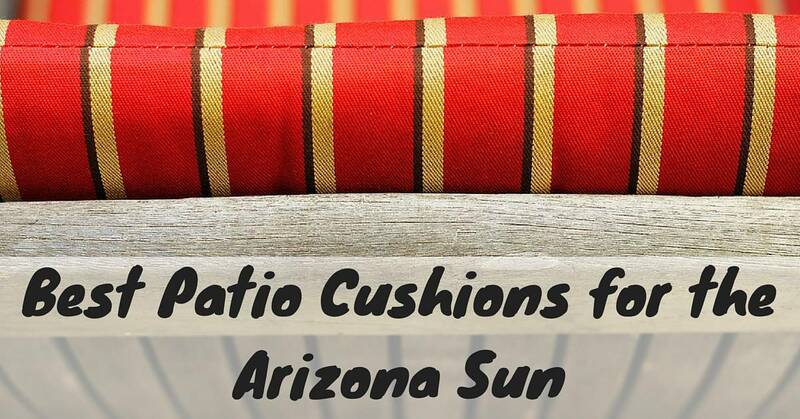 Because if this, vinyl cushions can become extremely sticky, sweaty and uncomfortable when in direct contact with your skin in the hot Arizona sun. Price Tag: Shower curtains are extremely affordable and can usually be found on sale somewhere. Outdoor specific curtain fabric is also less expensive than the other available fabrics, and is often created to withstand sun damage. Convenience: These materials are only suitable for the DIY savvy amongst us, as companies do not use these fabrics to sell pre-made patio furniture. Durability: While shower curtains are water resistant and outdoor curtains are fade resistant, neither fabric is created to take the constant day-in and day-out extreme sun exposure our sun doles out. These cushions will need to be recreated and replaced often. Also, as a friendly reminder, no matter what material you choose for your outdoor patio cushions and pillows, they’ll absolutely last longer under the protection of a CC Sunscreens patio shade.